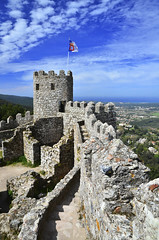 With a cultural, economic, and political background strongly influenced by conquering Romans and Moors, Portugal's history has had a lasting impact on the country's landscape and culture today. The Romans, who colonized the area in 219 BC and ruled for over four hundred years, built forts with high walls and strong towers that exist to this day. The Moors, who invaded the land in the year 711, brought new stonework and heavily fortified gates to the peninsula. Moorish influences in architecture and the arts are prominent everywhere. In the 15th and 16th centuries, during Europe's "Age of Discovery," Portugal, sitting at the edge of the Old World, ascended to the status of a World Power. Its vast Empire boasted of possessions in South America, Africa, Asia and Australasia. The Portuguese influence can be recognized in these regions of the world to this day, in language, culture, religious influence, and commerce. The Portuguese people reflect their diverse history in their cultural interests, including a deep appreciation of art, music, drama, dance, and culinary pursuits. Portugal's most important contribution to music is Fado, which is typically sung by a fadista, and accompanied by the portuguese guitar and the classical guitar. Fado appeared after 1830 in Lisbon, and spread to port districts like Alfama, Mouraria, and Bairro Alto. It is characterized by mournful tunes and lyrics, often about the sea or the life of the poor, and infused with a sentiment of resignation, fatefulness, and melancholy. Discover the best of Portugal with all its fine monuments, stunning cities, folksy traditions, and gorgeous landscapes shaped by multiple ethnicities down the centuries. In my twelve international tours, I have not experienced a more culturally unique and cost effective tour than our 2014 tour to Portugal. It is a wonderful balance of the old world and the future that is to come.